Bushman Equipment, Inc. manufactures a complete line of coil lifting equipment engineered to meet a variety of dimensional, capacity and special application needs. Quality-built throughout, these crane lifting attachments will provide years of continuous, safe, efficient coil handling. Bushman makes coil lifters to handle the narrowest slit coils up to the largest mill coils. Bushman’s narrow coil lifter can maneuver between 1″ wide coils with only a 1 ½” gap between them. The hooks are adjustable in two inch increments to permit handling coils of varying thickness. To remove a coil, the hooks are lowered with the feet parallel to the coils. Once the feet are in the ID of the coil, they are turned 90 degrees so they can lift the coil without damaging it or neighboring coils. For light to moderate duty cycle operations or where motorized devices can’t be used, the Bushman Model 427 Adjustable Coil Lifter is a good choice. High strength steel load hooks are easily adjusted for coil width, making the lifter very effective for use in narrow aisles. These manually operated telescoping leg coil lifters are well suited for low-duty cycle service. The Model M5067 motorized coil grab is one of Bushman’s signature products and is used by hundreds of metal service centers and mills. Combining operating efficiency, protection of the coil, and utilization of the overhead crane system, the M5067 motorized coil grab offers the most comprehensive coil handling features. The lifter can be operated with cab, pendant or remote controls. 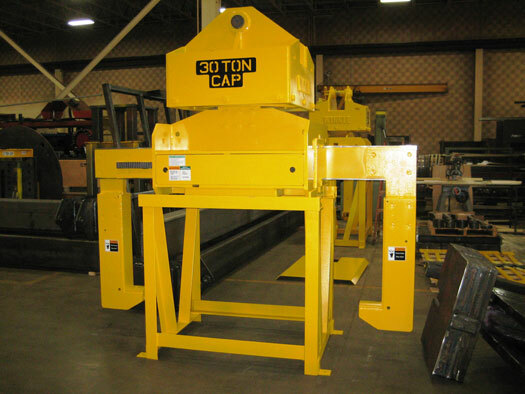 These coil grabs, available with capacities up to 75 tons, include replaceable, non-metallic wear bars in the frame. Many optional features are available to adapt the coil lifter to the particular needs of your coil handling system. The Model MR5067 has a motorized rotator capable of 340° of rotation for turning a coil to a desired horizontal axis position. A maintenance-free geared slewing ring is housed inside the welded steel frame. See below for further explanation of each option. Option 1. Connection to the crane–Standard pin bail (above left), pull-pin, low headroom, direct reeved sheaves, sister hook, pull pin bobbin, twin hook (above right). Option 2. Motorized rotation–The 350° stop-to-stop rotate drive has a ring gear and pinion driven through a motor reducer and slip clutch. Continuous rotation is also available. Option 3. Bushman Equipment, Inc. Weigh-Rite™ scale system has repeatable accuracy to ± 0.1% to 0.5% of lifted load in 10 pound increments. Includes digital scoreboard readout on the grab or wireless modem to transmit data to remote devices such as printers, PCs, scoreboards, etc. Option 4. Stack lights–Various colors are available to give visual indication to the operator when limit switches have been tripped and the grab is in position to lift the coil safely. Option 5. Tapered legs–Legs can be tapered away from the coil to allow clearance for slightly telescoped outer coil wraps, thus reducing the possibility of coil edge damage. Option 6. Urethane body bumper reduces chance of coil damage if grab frame contacts top of coil. Option 7. 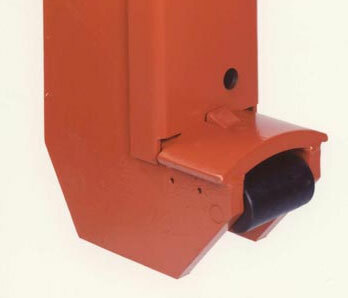 Flappers–Spring loaded pivoting flapper plates trip a limit switch after contacting the coil. Leg motion stops, reducing the possibility of damage to coil edge and unnecessary wear on the slip clutch. Option 8. Urethane bumpers–Coil contact surfaces are covered with replaceable bumpers. Lifting saddle bumpers are recommended for use when handling cold-rolled material under 0.015” in thickness, tin plate and surface sensitive materials. Option 9. Proximity and optical sensors can “see” the coil edge and alert operator when it is safe to close the legs to insert saddles into the coil ID. Option 10. Heel rollers protect coils in adjacent rows when lowering the grab into lifting position. Option 11. Toe rollers protect the edge of the coil being lifted. Urethane, steel or aluminum toe rollers are available. Option 12. End-of-travel switches electrically stop leg motion and can lengthen life of slip clutch. Option 13. 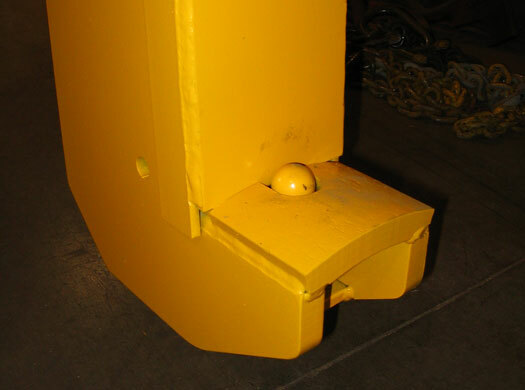 Storage stands permit grabs to be stored safely during maintenance and free up the crane for use without the coil grab. Coil lifters are large and top-heavy. They can cause significant personal injury or property damage if they fall over. When not in use, each lifter should be stored on a coil grab stand designed for its specific size and weight. Option 14. Motor controls–AC or DC motor controls are available to operate with local power supply voltage and frequency. Option 15. A sensor is mounted in one foot, as standard, to prevent the legs from being opened when a coil is being lifted. This sensor can also be mounted in the other foot as an optional extra. Other options can be provided. Please consult with factory. A variety of applications require metal sheet coils to be lifted with their I.D. facing upward, “eye to the sky”. Bushman can supply manually operated, fully automatic or motorized coil lifters. Slit coils from a slitting line or in coil storage can be lifted with Bushman’s Model 2020 Coil I.D. Lifter. Its lifting pads are lowered into the coil I.D. ; the legs are moved outward so the pads lift from the underside of the banded coil. Master coils can be lifted with Bushman’s fully automatic single or double rim vertical coil tong. This device is used most often for annealing operations where coils must be stacked directly on top of each other. This motorized pallet lifter is a Model M5067 modified with lifting forks. Coils on pallets can be more densely stored than by using fork trucks. At least 50% more coils can be stored in the same amount of floor space. 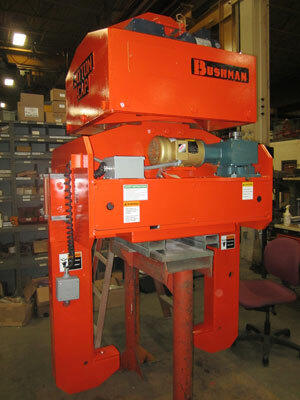 Bushman Equipment, Inc.’s motorized coil/pallet lifter can lift both eye horizontal coils and palletized vertical coils. The unit has fork assemblies to lift pallets and coil lifting saddles for lifting horizontal coils. The forks and lifting pads are motorized to permit changeover on-the-fly or when used with a cab-operated crane. When lifting coils on pallets, a set of motorized coil restrictors lowers to prevent tall coils from shifting on the pallet. 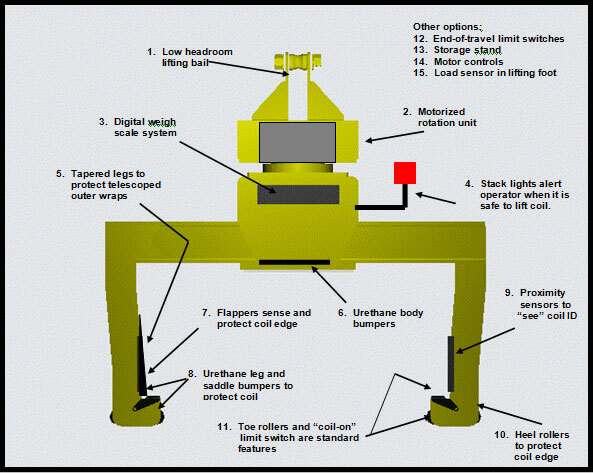 Sensors detect when either type of load is lifted to prevent accidental opening of the legs while carrying a coil. Other sensors and indicator lights aid the operator in aligning the lifter with the coil or pallet. Numerous coil protection features are also included. The unit shown above has the motor control enclosure attached to the grab. This enclosure can also be mounted on the crane. Capacity for palletized coils is 33,000 pounds, and up to 100,000 pound for eye-horizontal coils.